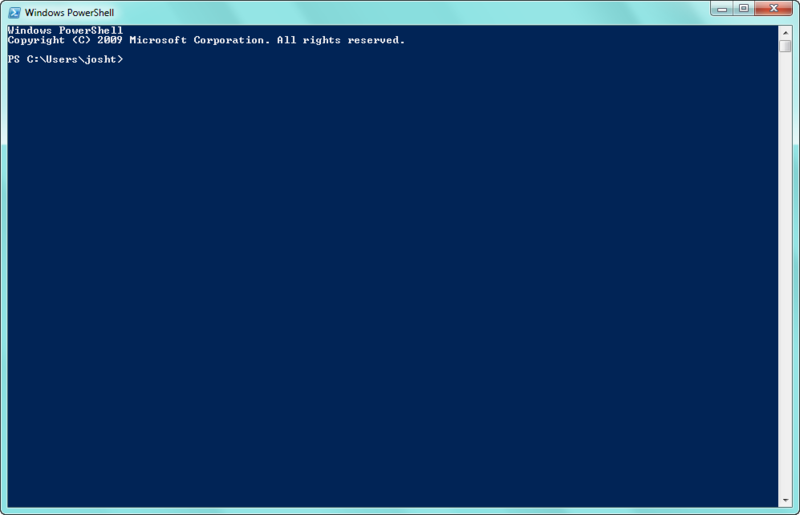 We’re all used to seeing the standard PowerShell console window. Nice, blue, boring. And that’s fine it does what it needs to do. 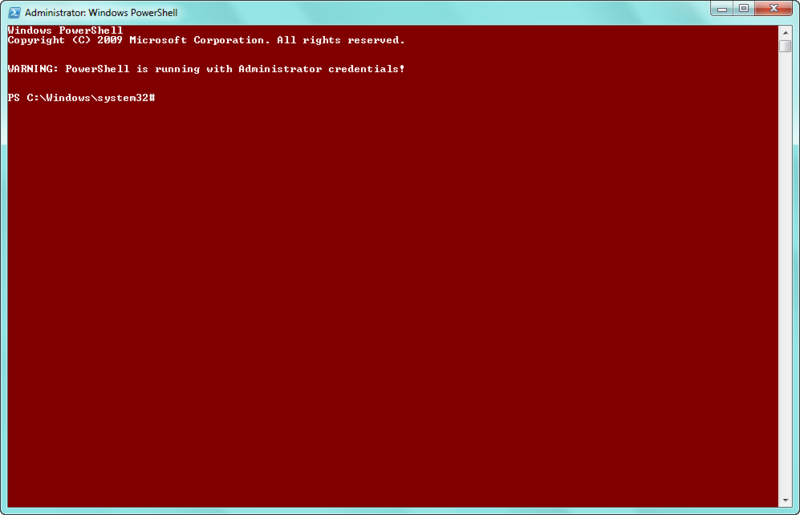 But what if we right-click PowerShell and “Run as administrator”? You get nearly the same thing. If you’re a point and click kind of person who doesn’t spend much time at the command line that may be fine for you. You’ve got one PowerShell console open, you know it’s running with administrative credentials because you just opened it, and you’re probably going to close it in a few moments when you’re done anyway. However, if you’re a command line junkie like me you’ve probably got a half-dozen console windows open across as many workstations and servers and keeping track of which are running with administrative credentials and which are not is impractical. I would much prefer to see something like this when running with administrative credentials. If the console is running with administrative credentials output a warning to the user. I’ll take each step in turn starting with the question “How the heck to I determine if my PowerShell session is running with administrative credentials?”. While there are a few ways to do this, the best answer is “Ask the system.”. If you’re not familiar with PowerShell and .NET that line might be a lot to digest. What we’re doing here is calling the GetCurrent static method of the WindowsIdentity class in the .NET framework (remember PowerShell is built on top of .NET), using the result to instantiate a WindowsPrincipal object, and calling the new object’s IsInRole method to see if it is in the Administrator role. If you don’t have a programming background and none of that made any sense to you not to fear, just know that we’re asking the .NET framework if the current user is an administrator. which both clears the screen and fills it with the new background color. These nested loops step through each character in the $buffer variable building each line’s worth of characters into a single string using the .NET StringBuilder class and then output each reconstructed line to it’s appointed location in the console window using Write-Host. In case you’re wondering why I go to all the trouble of reconstructing lines from the $buffer variable it is because this method improves performance over painting each character directly to the output window. The final, and probably most straightforward step is to output a warning to the console if the PowerShell session is running with administrative credentials. To do so we’ll use the same test we used previously along with Write-Output. Write-Output "CAUTION: PowerShell is running with administrator credentials!" Writing the warning to the console is done last so that it re-writes the prompt after the Prompt function has been redefined. We can thus (ab)use PowerShell’s internal buffer management to remove the old prompt and paint the new prompt for us during the Write-Output operations. But wait there’s more! If you simply copy your profile.ps1 script into %windir%\system32\WindowsPowerShell\v1.0\ on a system with a default installation of PowerShell you’ll get a nasty error each time you open PowerShell and the console won’t change as expected. This happens because to PowerShell your profile script is just like any other script and the default behavior for PowerShell is to not run any scripts. You can change this behavior using Set-ExecutionPolicy (as admin). I would highly recommend against a setting of Unrestricted. The safe bet, that still allows you to use a profile script, is to take the time so sign your profile.ps1 script and use the AllSigned execution policy. However, even this setting comes with some risk so be sure to read and understand how PowerShell execution policies work. For more information open PowerShell and see Get-Help Set-ExecutionPolicy and Get-Help About_Execution_Policies. Also note that there are 32 bit and 64 bit versions of PowerShell. If you’re attempting this setup on a 64 bit system you will need to make a copy of profile.ps1 in the appropriate location in both the System32 and the SysWow64 folders. You will also need to set the execution policies for both 32 and 64 bit environments. Hopefully you find this information useful. For convenience I’ve attached the complete profile.ps1. The included script does not contain a signature because in my environment it is signed by an internally trusted CA so it wouldn’t do you any good. Beside now that you know the potential of profile scripts you’ll likely want to expand and improve the included script to suit your taste anyway. If you need help with self signing your profile script Scott Hanselman has an excellent walkthrough. As a bonus here is the equivalent registry command to mimic the behavior in cmd.exe using Arron’s original technique. Note that it is wrapped to several lines here for ease of reading but should be a single line when entered (or copied) into the console. Again, on x64 platforms you’ll need to do this twice, once in the native 64 bit environment and once in the 32 bit WoW64 environment. 2 Responses to Setting the color and properties for all CMD and PowerShell windows based on admin / elevation status. Warning: A return code issue may occur if using regedit, bcdedit or other commands that return non-zero exit code. You may not be able to run some install or maintenance scripts correctly. For exact example see the link. You are correct, in fact I’ve experienced this exact issue in rare cases. Specifically with the MS Office Installer. However, you can easily work around this issue by explicitly calling cmd.exe and adding /D switch.